Enclave at Bonita Bay in Bonita Springs Florida. Bonita Bay homes for sale. Enclave at Bonita Bay a neighborhood of fifty-four single family villa homes located in Bonita Bay in Bonita Springs, Florida. Enclave at Bonita Bay is located just off of Country Club Drive south of the main gate. The Enclave consists of three streets, Enclave Drive, Key Lime Court and Sawgrass Court. The homes in The Enclave were built from 1988 to 2003. The community is built out and there is only resale real estate in The Enclave available. Villa homes in The Enclave have from 2-4 bedrooms and from 1,775-2,400 square feet of living area. Many of the homes feature their own private swimming pool. All homes have a two car garage. Homes in Enclave at Bonita Bay are structured with outside maintenance of the lawns and gardens included in the quarterly assessment. Landscaping is taken care of so living in The Enclave is the next best thing to care free condo living yet owners enjoy the benefits of single family home ownership. Views from the lanais of homes in The Enclave included wooded views, golf course view or lake view. 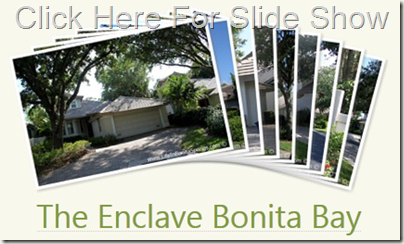 Home owners in The Enclave can easily access the walking path system of Bonita Bay, which runs beside the community. In addition, River Park of Bonita Bay at Bonita Bay is nearby and offers additional walking trails, playground, tennis courts, boat ramp, work out stations and more. Home owner of The Enclave also enjoy use of the many amenities of Bonita Bay which include Spring Creek Park, Estero Bay Park, The Beach Park and optional memberships including marina membership, social membership, fitness membership and golf membership. For more information about the fabulous, resort style amenities at Bonita Bay, read also: Bonita Bay Golf and Country Club. Real estate in Bonita Bay which is similar to the Enclave includes Montara at Bonita Bay, Laurel Ridge at Bonita Bay and Cracker Cove at Bonita Bay.